Tamara and Jason met as correctional officers in the United States (Yes of course I had to ask her about Orange is the New Black!… and she told me that for the most part its pretty true to life), they were partnered together for self defense classes. We did this wonderful day before photoshoot at the Faro (lighthouse) here in Rincon. Their destination wedding was right down the beach from where we did this engagement style portrait session. I find that destination wedding photographers in puerto rico can sometimes get in a rut with coming up with creative portrait ideas since we are usually photographing on the beach. Using some creative photography tricks any place can become the perfect spot for portraits. Pre and Post photo sessions are great because there is extra time to spend focusing on making wonderful images, there also isn’t the pressure of a time line or other people around. During Tamara and Jason’s session I did some more creative photography; double exposures and I also used my infrared camera. Having the extra time and space as well as a couple who is up for making something beautiful is the best space to create amazing new pictures. I always highly highly recommend doing an additional portrait session as an add on to wedding photography. I tell my friends that most photographers will even do it at a discounted rate if they are already doing the photography for the wedding. Its always worth it and another chance to have fun in front of the camera… and if you doing a post wedding session it could be another opportunity to wear your dress! Check out my website and my wedding collections. 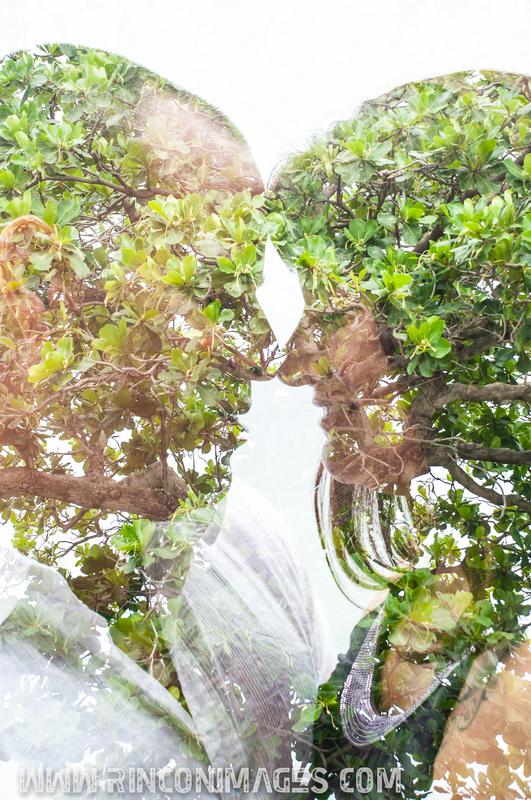 Double exposure from a day before session at the light house park in Rincon, Puerto Rico. An infrared photograph of the bridal couple the day before their wedding at the Light House park in Rincon, Puerto Rico.